?Do I need an attorney if a driver hit me while I was riding my bike? ?What laws do Tennessee bicycle riders have to follow? ?Who can be held liable in a bicycle accident? 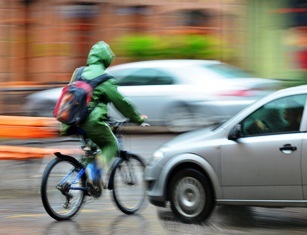 While the majority of bicycle accidents are caused by drivers of passenger vehicles, there can be many parties who played a role in causing the crash. The individual who can be held liable for the crash—and therefore, the costs of any injuries or property damage associated with the crash—is the person who's found to be guilty of negligence. Since bicycles don't offer any of the same safety features that cars have to protect individuals from injury, the costs of a crash can be significant. As a result, bikers have to carefully examine the circumstances of the accident in order to determine which entity is liable for the full cost of the damages. Driver negligence. Driver negligence can be anything from a motorist swerving into a bike lane to leaving the scene after a bicycle hit and run crash. Common negligent actions include driving too close to a biker; opening a car door into a biker’s path; turning in front of a biker; or running a biker off of the road. Motor vehicles are required to maintain a safe space while riding next to or passing bicyclists, obey right of way laws, and to share the road responsibly with all types of vehicles. If your accident involved a car, truck, or other passenger vehicle, it's likely the driver (or the driver’s insurer) will be named in your claim. Cyclist negligence. If the biker was performing an unsafe action, he or she may be partly liable for the accident and recover less in damages as a result. Under Tennessee’s comparative negligence laws, a victim who's found to be mostly liable (51 percent or more) for causing the crash isn't entitled to recover any damages. If the percentage of fault isn't as high, and damages are still awarded, they're reduced based on the victim’s portion of blame for the crash. For example, a bicyclist who was riding against the flow of traffic; riding in the road instead of in a dedicated bike lane; or who makes an illegal maneuver may have a hard time collecting full payment from another at-fault party. Pedestrian negligence. There are many instances when pedestrians can cause bicycle accidents, some of which may result in severe injuries. Bicyclists are required to stop for pedestrians just as cars do, and if a pedestrian steps off of the curb into the path if a cyclist, the cyclist may not have time to slow down or avoid a collision. In these cases, bikers must still prove that the pedestrian's negligence was the main contributing factor in causing the accident. Hazardous road conditions. Bikers have just as much right to safe riding paths as cars have to hazard-free roads. In fact, bikers are owed a greater duty of care, since they are much more likely to be injured if a riding surface is defective. Fallen rocks, spilled gravel, potholes, construction, debris, leaf piles, and sudden changes in the road surface are all potential hazards that municipalities should address before they cause an accident. In cases where an obstacle cannot be avoided (such as a curve in the road, sewer grate, or railroad tracks), municipalities are required to post clear signs warning of the dangers. Defective or unsafe bicycle equipment. While it may be tempting to think that some accidents just “happen,” the truth is there is always a reason that crashes occur. Defective bicycle frames, brakes, chains, and tires all increase the risk of a crash, while defective helmets and safety gear can make injuries sustained in a crash much more severe. If your bike didn't perform properly in an accident, you should have the bicycle examined for poor frame welding, lax safety standards, poor design, and other defects. If you or someone you love has suffered a bicycle accident injury, our Tennessee attorneys can help you get the compensation you deserve. Fill out our online contact form today to schedule a free, no-obligation consultation with our legal team.